Preheat the oven to 110°C. Place the finely chopped white chocolate in a glass roasting dish and put it into the oven. Roast the chocolate, stirring and smearing it around the dish every 5 – 10 minutes with a heatproof silicone spatula, to smooth out and stop the chocolate from burning in places. Roast until the white chocolate is deep golden caramel in colour, about 45 – 55 minutes. When the roasting chocolate has almost reached the desired colour, add the fresh cream and vanilla essence to a small pot and bring to a boil. Remove from heat and scrape the roasted chocolate into the warmed cream mixture. Stir to melt the chocolate and cream together until smooth (if stirring alone does not create a smooth consistency, use a stick blender to combine the mixture until smooth). Place the caramelised chocolate mixture in a glass bowl, cover with cling film and refrigerate until firmed up, about 45 minutes. Scoop out dollops of the mixture and, using the palms of your hands, roll into 2cm-diameter balls. 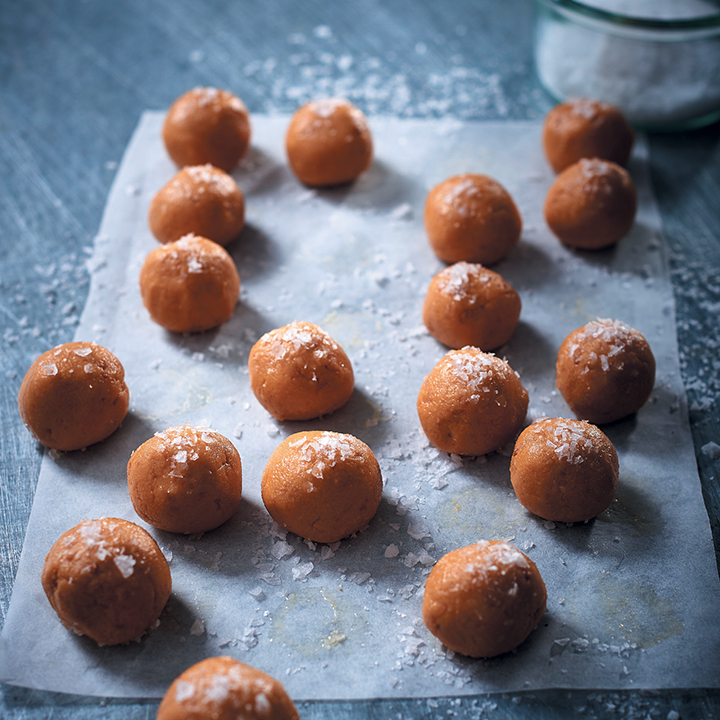 Arrange the balls on a tray lined with baking paper and add a small sprinkling sea salt flakes to the top of each truffle. Wrap in cling film and refrigerate until 10 minutes before eating (the truffles will last up to 3 days in the fridge).